Start/Parking: For this walk you need to set off early to make sure you can park inthe free car park which is next to the Robin Hood pub just off the A619 road to Baslow (DE45 1PQ). You start and finish the walk here which is great because the pub serves great beer and Panini’s. Walk summary: I started this walk at 10.40 on a bank holiday Monday. When I arrived there were a couple of parking spaces left but the weather wasn’t great. The full walk is 8 miles and takes about 4 hours. I was walking with my 10 year old daughter so we only did 3 hours, about 5 ½ miles. Leave the car park and walk down the main road towards Baslow. Just after the camp site sign on the right you’ll see a footpath sign and a stile on the other side of the road. This is where you take your life in your hands and try to cross. Sometimes this road is busier than the M1! Once you’ve survived the crossing descend the steep steps, over the bridge and up the hill to a “cross roads”. You need to go straight ahead following the sign for Beeley via Swiss lake. At the top climb over the ladder stile and continue on the path to the left. 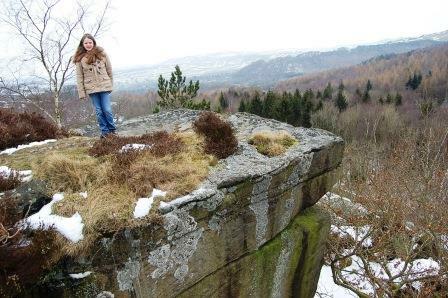 This is “Dobb Edge” – you should take great care. After the roped section climb over the stile into the field and climb the other a little further down the wall to the right. Descend the rocky path. 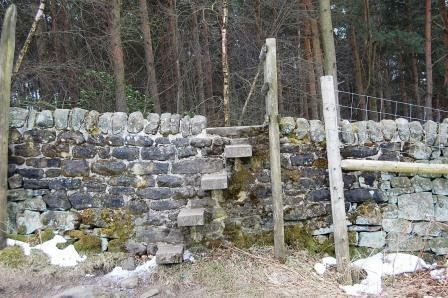 Continue on the path upwards to another stile and keep following in the same direction (it goes down and then up following a wall and heads towards the woods. Once in the woods turn left and then right on the main path and follow. This path goes past the farm buildings on the left and deeper into the woods. 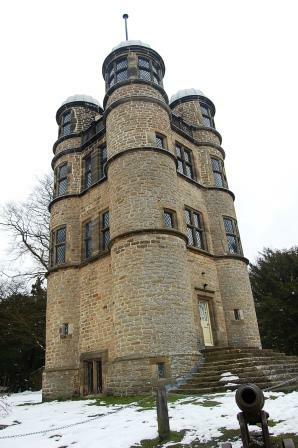 Continue along the main forest road until you come across Chatsworth’s Hunting lodge. Now I’ve always wondered what the hunting lodge was for. Historically it was where the ladies gathered to watch the hunt. Now you can hire it out for a romantic stay! Descend the steps in front of the lodge and turn left. We walked down the main forest track and passed the aqueduct which feeds the Chatsworth fountain. The road bends to the right. Follow this past the farm/play area and to the stables. Once you’ve a look around walk down hill with the house on the left. Carry on through to the bridge at the bottom which goes over the Derwent. Don’t cross it take the path to the right and follow the river to the cricket pavilion. As you reach the cricket boundary fence turn right to the main path. Follow the main path left, pass the white lodge, and take the right hand fork to the Kissing gates. Follow this path; pass the house continuing right around the house. Follow this path to the bridge, over the bridge to the Nether end of Baslow. We reached hear at 12.20 and decided to call it a day, well walk back to the Robin Hood about 30mins. To return to the Robin Hood follow the main road right, past the Wheat sheaf, straight on at the roundabout, and follow the road until you reach the car park you started from. OK if you’re going to continue the walk. Cross the main road and walk up Eaton Hill (the Italian is on the corner). Walk as far as the road where you turn right. This is a no through road for traffic; at the end there is a track. Walk up this steep track until you reach the moors. Walk up and past the stone cross “Wellington’s monument”. Follow the obvious path for a while following the wall and downhill. You’ll come to a gate at the bottom. Turn right down the road and over the junction. You’ll find a stile on the right just after the junction. There are 2 paths, choose the left hand path. You’re heading to the distant ridge on the left so follow the best route. You reach some rocks there is a small path to the left which takes you to a more defined path leading up to the ridge. Follow the ridge as far as a water hydrant where you turn right down a steep descent which overlooks a 3 par golf course which is behind the Robin Hood pub. We hope you have enjoyed the Robin Hood pub walk as much as we did. A pint of Jennings and a Panini went down very well when we finished the walk. My daughter obviously had a coke (and her own Panini, she deserved it).